I love potatoes and I am always trying to find new potato recipes. I got this one from http://www.recipezaar.com/ and I had to lighten it up a bit, otherwise it was going to be 11 points instead of 4 points per serving. Decreasing the olive oil from 1/4 cup to 1 tablespoon help lower the points significantly. I just couldn't justify having a side dish that was half the points I am allowed for one day! I love the combination of honey and dijon mustard. It goes well on potatoes. It's a side dish that goes with most anything. 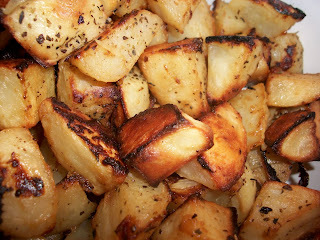 Mix together mustard, honey, oil and salt and pepper; add to the potatoes and onion slices. Pour the sauce over potato/onion then toss well coate. Bake for 35-40 minutes or until potatoes are tender. Sprinkle fresh parsley over potatoes.